However, the sellers must walk a fine line between uncovering how the buyer to see his, or her business and showing them their business reality. Let’s take the first one – how the buyer sees him/herself – first as it is arguable the most important. The seller’s solution and how it is presented must be consistent with how the buyer sees himself, or herself. By holding a mirror up the salesperson can better understand the buyer’s self concept, that is their view of themselves, their business and their team. Understanding how the buyers sees his, or her business, unit or team and its industry is essential. That includes its opportunities and challenges, as well as its strengths and weakneses, etc.). This is what shapes the buyer’s perception of his, or her needs. As sellers we are keen to highligh the needs and deficiencies of our prospects. We zealously promote the idea of audits, diagnoses, benchmarking of the prospect in order to provide us with greater leverage in the sale. However, we often overlook one key dimension – the buyer’s self concept. It does not matter whether a company has in reality a need. A company’s factory machinery may to the seller be clearly out of date, and their in-house expertise demonstrably inadequate, however all that is irrelevant if it is inconsient with how the company sees itself – its self concept so to speak. As sellers know only too well this self concept can be both impervious to reality and resistent to change. An experienced salesperson put it this way; ‘No doubt, no sale’. What he meant was ‘ you cannot sell to somebody who is not prepared to enterain the notion that what they have, or what they are doing at present can be improved.’ As psychologists continually tell us people cannot act in a manner that is inconcistent with how they see themselves. That means that they are going to struggle to buy anything that treatens how they see themselves. 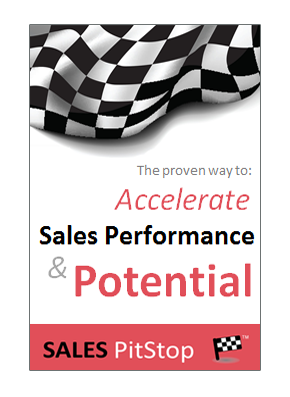 That means the salesperson’s job is to protect and indeed enhance the buyer’s favourable self concept. The recognition of a problem, or a need, if it is inconsistent with the self-concept (of either the buyer, or the buying organisation), is likely to be slow and uncertain. Try selling management training to a management team that sees itself as having little to learn, or selling software to an organisation that sees itself as having an expert in house development team – these are just two simple examples. It sounds very obvious but matters is whether the buyer can see that need and the degree of importance that they attach to it. The reality of the need is only a secondary matter. If either the solution, or the way in which it is sold, encroach on the buyer’s self concept, then the seller is in for a difficult ride. 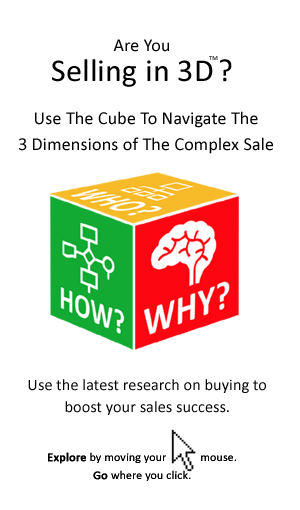 The problem is that with high value complex sales this is very often the case. Longer buying cycles are the result of greater information gathering, analysis and planning by buyers in respect of major purchases, something that we urge sellers not to underestimate. However, all this information gathering and analysis does not take place in a vacuum. Even the most scientific manager-buyer has a self concept! That is enough for now about how the buyer sees him, or herself today. Holding a mirror up to the buyer is also aimed at understanding and indeed shaping the buyer’s vision as to its future. The salesperson’s job is also to help the buyer to envision their ideal future, as well as the future of their industry. In so doing it is to ‘begin with the end in mind’ – that is the objectives to be achieved by means of the purchase. That includes envisioning their business after problem has been solved, or the opportunity has been exploited. The salesperson must then help the buyer to ‘go back to the future’ and to show how his, or her company can help the buyer to get there. That is to help them to join the dots that link their desired future and their present realities, with your solution.